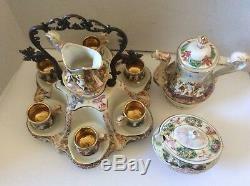 This is a vintage early to mid century, original Capodemonte demitasse coffee set. 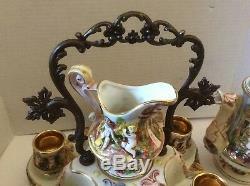 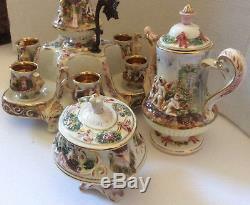 In this set 6 cups, creamer, sugar bowl with lid, coffee pot and two-level stand with intricate metal handle. 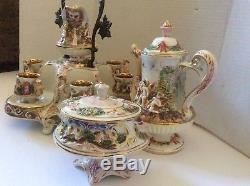 Measurements: Stand 13" x 13" x 13" with handle, Coffee Pot 9.25" tall, Sugar Bowl 6" x 6.25" x 5.25", Creamer 5" tall, Cups 1 7/8" in diameter and 3" tall with handle. 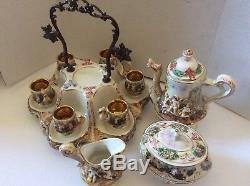 The set is as pictured, as is. 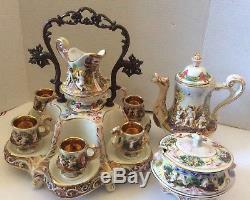 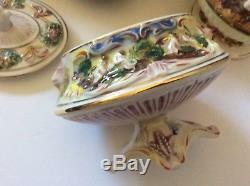 Fantastic classics, traditional Italian, hand painted Capodemonte set. 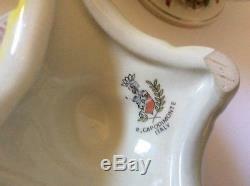 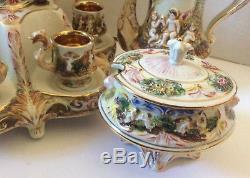 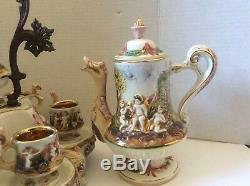 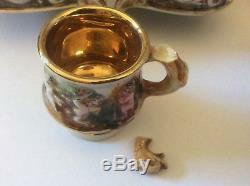 Capodimonte Italy Demitasse Set Cups Sugar Bowl Coffee Pot & Stand Cupids" is in sale since Saturday, February 10, 2018. 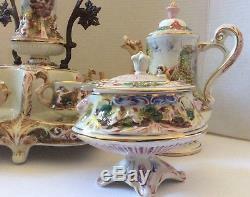 This item is in the category "Pottery & Glass\Pottery & China\China & Dinnerware\Capodimonte".